This afternoon Archbishop Eamon Martin will oversee ceremonies at St Macartan’s Cathedral in Monaghan to formally install Msgr Larry Duffy as the new Bishop of Clogher. During the week, the Bishop-elect, who succeeds Bishop Liam MacDaid, unveiled his episcopal crest and motto. 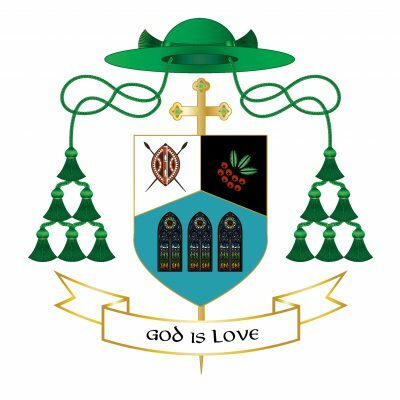 He has chosen “God is love” as his episcopal motto, while his crest incorporates symbols of the Diocese of Clogher, his ministry in Carrickmacross, his home parish of Magheracloone and his links with the Diocese of Kitui in Kenya. Bishop-elect Duffy’s crest has three sections and three background colours. The white and black are a reference to his native parish of Magheracloone while the blue denotes his association with and love of his native Monaghan. The Masai shield and the two crossed spears feature on the national flag of Kenya, and represent the Bishop-elect’s strong links with the Diocese of Kitui where he ministered for several years as part of the Diocese of Clogher missionary outreach there. He still visits Kitui often, and a number of Kitui visitors will be in the congregation for the episcopal ordination. The rowan berries and leaves are a tribute to St Macartan, the first Bishop of Clogher. Before his conversion to Christianity by St Patrick, Macartan was known as Aidis or Aedh, the son of Caerthen (son of the rowan tree). The three leaves also recall the baptismal profession of faith in the name of the Blessed Trinity. The bottom part of the shield shows an image of three stained-glass windows. These refer to St Joseph’s Church in Carrickmacross where Bishop-elect Duffy was Parish Priest from 2013-2019. The renowned stained-glass artist Harry Clarke was commissioned in 1924 to design and create a two-light window for the church in tribute to St Ceara. This was followed by a further series of windows by the Harry Clarke Studios. The windows represent the beauty of God’s light, shining through the saints. Speaking to CatholicIreland.net ahead of his installation, Bishop-elect Duffy expressed his gratitude to the “many people who do so much for church and for faith, including priests and lay people”. He said it was a great credit to so many that they have stayed with their commitment despite a rough 20–25 years when morale had been challenged. On the matter of safeguarding in the Church, he told CatholicIreland.net, “Children and vulnerable adults have to be protected at all costs, and the church has to do its very best to support the care of vulnerable people and those who have in any sense been abused. He paid tribute to the thousands of volunteers across the Irish church who are committed to safeguarding in parishes and parish groups around the country. Since 2013 Bishop-elect Larry Duffy has been the parish priest of Carrickmacross. He comes from the neighbouring parish of Magheracloone. He was born in Ballybay on 27th November 1951. Bishop-elect Duffy’s parents were the late Thomas and Elizabeth Duffy. He has three surviving siblings, his sister Anna and brothers Patrick and Peter. Their other brother Brendan died two years ago. 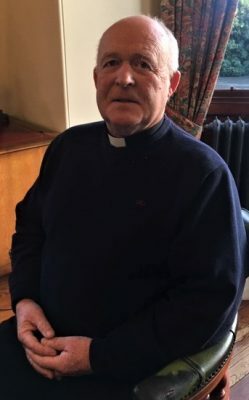 Having completed his studies for the priesthood at St Patrick’s College, Carlow, he was ordained in St Macartan’s Cathedral, Monaghan, in 1976. Since then Bishop-elect Duffy has served in various parishes of the Diocese of Clogher including Enniskillen, Castleblayney, Monaghan & Rackwallace (Cathedral parish) , Ederney, Clones and Carrickmacross. In addition, he spent four years ministering in the Diocese of Kitui in Kenya. While in Africa he led the building of a new church in Mwingi in the diocese. He was also a keen supporter of religious communities in their setting up of schools in the Diocese of Kitui. 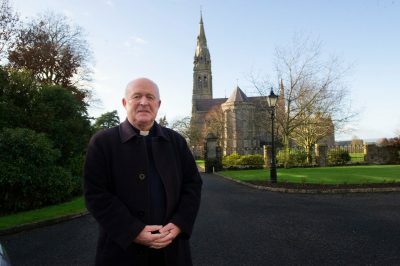 Bishop-elect Duffy was Vicar General of the Diocese of Clogher from 2013 until the retirement of Bishop MacDaid in 2016. The Chief Ordaining Prelate this afternoon will be Archbishop Eamon Martin of Armagh, Primate of All Ireland, who will be assisted by Bishop Noel Treanor of Down and Connor and Archbishop Jude Thaddeus Okolo, the Apostolic Nuncio to Ireland. Another 24 bishops will also concelebrate as will priests and religious clergy from the Diocese of Clogher, priests who are classmates of the bishop-elect, priests from the Diocese of Kitui in Kenya where the new bishop ministered for four years. Representatives of other Christian denominations in attendance will include Bishop John McDowell, Church of Ireland Bishop of Clogher, and Archbishop Michael Jackson, Church of Ireland Archbishop of Dublin, who is a former Bishop of Clogher. In attendance at the Mass will be family and friends of Bishop-elect Duffy; representatives of primary and post-primary schools and of Church groups from the Diocese of Clogher, as well as representatives of civic society. During the ceremony Bishop Duffy will exchange greetings with representatives of various aspects of life in the Diocese of Clogher. He will address the congregation during the Concluding Rites.